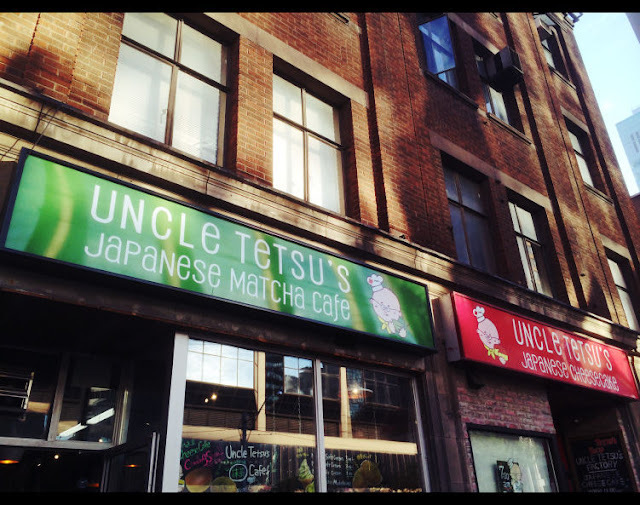 We walked West on Dundas to Bay St, and crossed the street to Uncle Tetsu’s on our right, located at: 598 Bay St, Toronto, ON M5G 1M5. Matcha Green Tea Soft (ice) cream, Milk Soft (ice) Cream, or a Mix of the two in cones or in cups, and Green Tea Madeleines, a small freshly baked cake. Apparently in August they will start serving Matcha style Cheesecake as well. Uncle Tetsu’s Cheesecake side serves their signature Cheesecake exclusively, but we didn’t even attempt to try it due to the incredible line. There was a line for each shop, and when we joined the Matcha Café line it had about 10 people ahead of us, while the cheesecake line was at least 20 people easily. Ain’t nobody got time for that! In fact, the Cheesecake line was so notoriously long with cheesecake cravers that the line actually spawned its own Twitter account, which posts the current status of the line randomly throughout the day. This is not a joke! Check it out by clicking here. 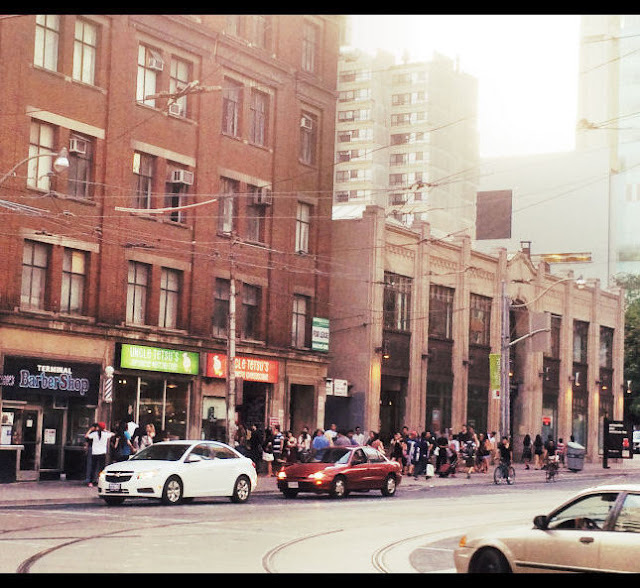 There was an internal battle going on within my mind during this time, as I hate lining up for things and I would rather do absolutely anything else other than line up for things. But curiosity won the battle and we remained in the line for around 30 minutes, watching the shop employees scrambling frantically to make more Madeleine batter, baking more and more trays of ‘em nonstop, mixing new Ice cream concoctions, and refilling the ice cream machine a few times. We're near the doors in the line now! The shop smelled delectable with the aroma of freshly baked goods, though it was quite warm inside. People were buying the madeleines by the truckload it seemed, but since we weren’t convinced it was the best thing ever just yet, we settled on buying two of the “Mixed” Milk - Matcha Ice creams in a cup and in a cone, and also one madeleine to try. I really felt for the employees who seemed to be working nonstop for hours inside as the line never ceased, so we had a little trouble with the card machine which refused to let us pay with various credit cards, but was told after trying for the fourth time that they only accepted debit. Oops! Store fronts. They are actually connected inside but have separate entrances. Due to technical difficulties which are probably because we started eating our ice cream as soon as it was handed to us, we don’t have any pictures of the ice cream. But you can check out some pictures by others by clicking here. My first thought about the ice cream was, “Oh, it’s just ice cream”, but after devouring it steadily on a shop corner a few steps away from Uncle Tetsu’s, I was sold. The Matcha-Milk Ice cream could be compared to freshly made ice cream you’d make at home with only a few good ingredients. It was soft, kind of “juicy”, and very refreshing. It was only slightly sweetened, which was lovely, although you could taste the distinct flavours of green tea and something similar to vanilla. The cone was just a regular cone, nothing special, but it worked. It was worth the wait, I admit. 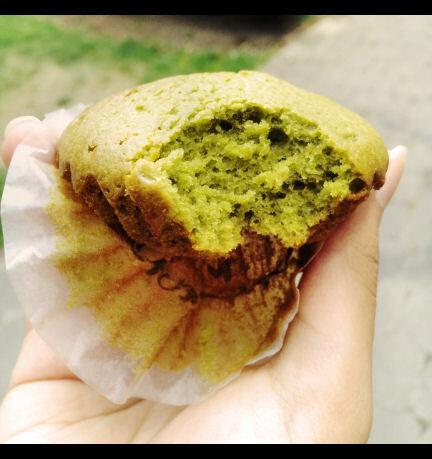 The Matcha Madeleine was fresh and warm from the oven, and it was gloriously green on the inside from the Matcha Tea powder. It has the texture and consistency of a cupcake, but the taste was something else. It seemed deceptively simple at first, but it had this home-baked lovely buttery taste slightly accented by green tea, and I could’ve probably eaten 2 or 3 more. 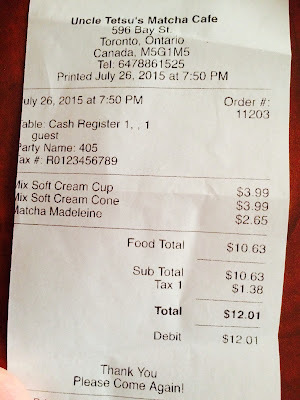 For 4 dollars per ice cream this is a little on the pricey side and definitely not your every day snack, but it is worth the splurge at least once. The Matcha Madeleine is quite small for the price, and if you ordered 10 for friends that's a good 30 dollars worth of cakes, so I would think twice before buying a couple for sure. I don't know if I would line up for half an hour again for what I had, but it was worth the try. I docked Wonton points for price and wait times, but otherwise the food itself was lovely, and if I did see a shorter line for the cheesecake someday, I would probably line up for it. 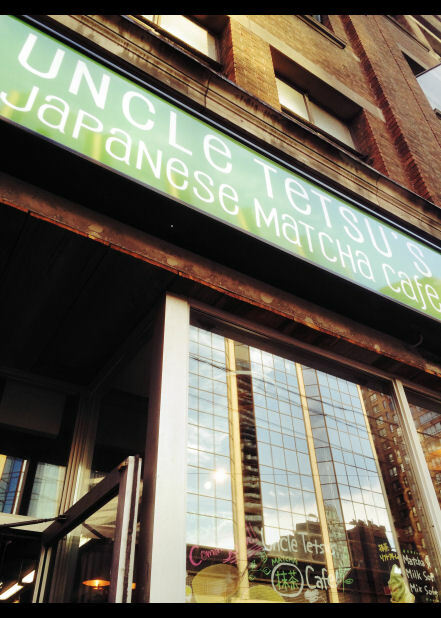 Question for our readers: Have you tried Uncle Tetsu's yet? Planning on trying it? Let us know your experiences in the comment section below or on Facebook! 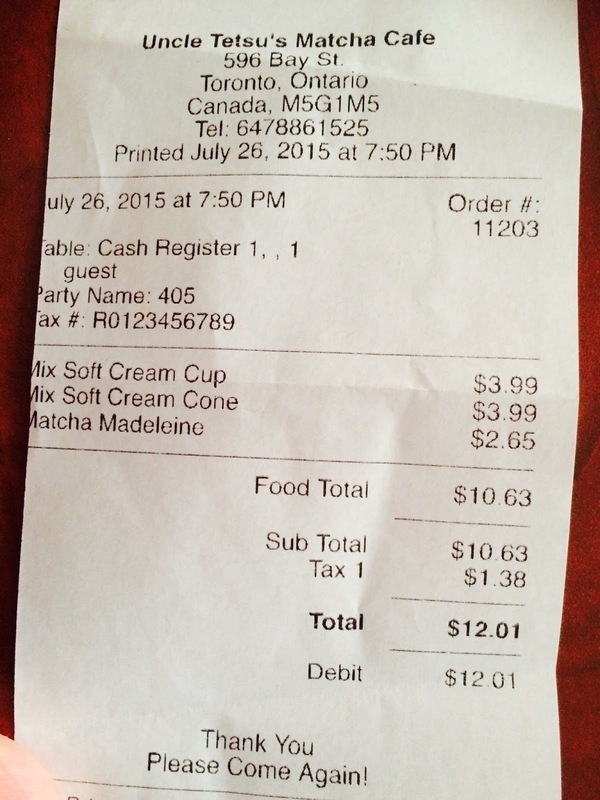 In Canada not many things are halal certified unless it's a specific halal meat brand. Otherwise, with things such as desserts, we just have to inquire ourselves and ask whether there any specific ingredients are included, such as gelatin. At the time of our asking, the ingredients were fine, however we always recommend asking before eating anything which isn't branded as halal.